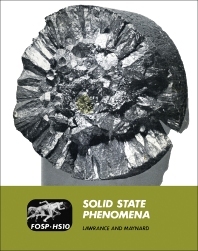 Solid State Phenomena explores the fundamentals of the structure and their influence on the properties of solids. This book is composed of five chapters that focus on the electrical and thermal conductivities of crystalline solids. Chapter 1 describes the nature of solids, particularly metals and crystalline materials. This chapter also presents a model to evaluate crystal structure, the forces between atom pairs, and the mechanism of plastic and elastic deformation. Chapter 2 demonstrates random vibrations of atoms in a solid using a one-dimensional array, while Chapter 3 examines the resistance of tungsten under various temperatures and measures its temperature coefficient of resistance. Chapter 4 surveys the increase in the number of conducting electrons in a solid when illuminated with light of sufficiently high photon energy to excite electrons out of filled valence bands. Chapter 5 considers the concept of diagmagnetism, paramagnetism, and ferromagnetism in solids.